When purchasing a home, nobody expects to face financial hardship. Life uncertainties can happen when you least expect it. During these stressful situations, there is hope! A short sale specialist can begin to help the healing. JUST BECAUSE A REALTOR IS EXPERIENCED...DOES NOT MEAN THAT HE/SHE IS EXPERIENCED WITH SHORT SALES. If you or a loved one were sick and in need of a specialized doctor, would you go to a general doctor or would you seek the services of an experienced specialist? The same principle applies with real estate agents. A short sale transaction is without a doubt, the most complicated transaction in residential real estate. We provide the proper paperwork, negotiate the short sale on the homeowners behalf. We help alleviate the stress, answer and guide the homeowner every step of the way. We have helped many people stop their pending foreclosures, negotiated debt forgiveness, and helped our clients move on with their lives. Short sales are complicated and require an experienced professional. We are highly trained. All lenders have different guidelines. We have worked with most lenders and banks to complete the short sale process. We are certified and EXPERIENCED. CDPE (Certified Distressed Property Experts) and SFR (Short Sale Foreclosure Resource) certifications along with tons of short sale experience with many successful short sale closings. Contact Us to discuss your options. A foreclosure can be mentally and emotionally draining and publicly humiliating. A short sale will help you avoid this, and move on with your life. A short sale can help protect your financial future, salvage your credit and save your dignity. Did you know that many people have been able to buy just after two years of a short sale? Banks typically report to all three credit reporting agencies that your account has been "legally settled short of full payment." A short sale shows responsibility on your credit because you made a choice to cooperate with the lender, versus abandoning the property and allowing the home to foreclose. Did you know that a foreclosure stays on your permanent record? Yes, you may be able to buy again after 7-10 years but the foreclosure evidence does not go away. How Much Money Does a Short Sale Cost? 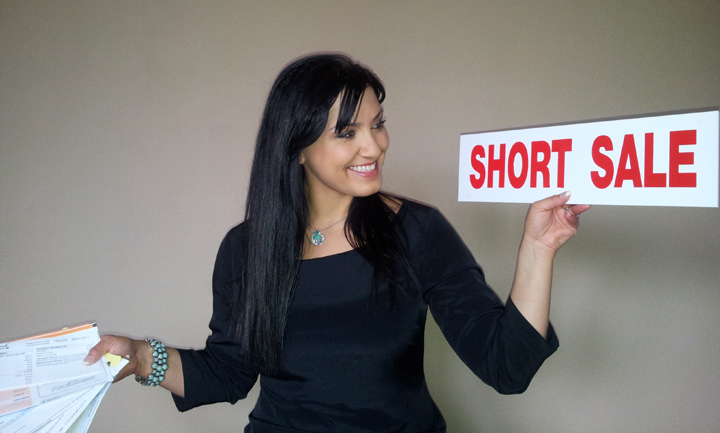 How much money do you have to pay by choosing to do a short sale with Mick and Julie Perez? ZERO, ZILCH! Our Short Sale Service is FREE. While many Brokers charge upfront fees to do a short sale, we do not. Beware of Realtors who charge you "upfront fees" for short sale service. Do they guarantee that ALL your money will be refunded if the bank denies your short sale? Probably not. We will NEVER charge you junk fees. You will not be required to pay for appraisal fees, inspection fees, or repairs. When you use Mick and Julie Perez, to represent you, we do not charge you a dime. We ONLY get paid if the short sale is approved, and we get paid by the bank...NOT YOU. This is a guarantee. We understand that this is a difficult time. We do NOT use outside negotiation companies. Many Realtors hand over the file to other companies and/or other people. We are 100% hands on. We manage your entire file and all of your information is 100% confidential. We personally handle the negotiation process with the bank and will take care of your every need from Prior to LISTING all the way to CLOSING. We have the experience a proven system and successful track record to help you throughout the entire short sale process from the beginning to the close of escrow. If a short sale is the right decision for you, be proactive. You can start by gathering your paperwork before you meet with your realtor. We have provided a short sale checklist below. In addition to the short sale documentation checklist that we have provided, each short sale lender may operate under their own specific guidelines. They may have their own lender required forms. It is recommended that you research their websites for these short sale documents. Please don't hesitate to call us if you have any questions. You may email or contact us by phone and we will provide all necessary paperwork to get you started. Hardship Letter signed and dated by borrower/borrowers. Reason for hardship including dates and reason that income or expenses changed. Please let us know right away if you currently have any other liens or behind on other payments including taxes, HOA, child support, etc. We have a great history of closing short sales and we are here to make this a smooth and pleasant experience! Mick & Julie Perez have successfully closed many short sales in So. California. They are both Certified Short Sale Specialist, Certified Distressed Property Expert (CDPE), Foreclosure/REO Specialist & was awarded the SHORT SALES and FORECLOSURE RESOURCE certification (SFR) by the National Association of Realtors (NAR). The NAR's SFR certification is the only one of its kind that focuses on both the buyer and seller sides of the transaction in a short sale/foreclosure.